In Fugitive Days, Ayers tells the real story of the defining events of the radical ’60s. The book is an eyewitness account of a young pacifist who helped found one of the most radical political organizations in U.S. history, and who consequently lived for ten years as a fugitive. In a new era of antiwar activism and suppression of protest, Fugitive Days is more poignant and relevant than ever. “With considerable wit, no small amount of remorse, and an anger that smolders still across the decades, Bill Ayers tells the story of his quintessentially American trip through the 1960s. That it is written in a consistently absorbing style with many passages of undiluted brilliance only adds to its appeal. —Thomas Frank, author of One Market Under God and What’s the Matter with Kansas? That pretty well sums up a central function of every government on earth: conservative and liberal, reactionary and progressive, authoritarian, democratic, fascist and socialist and royal. The only question is, who should be taxed, how much, and where should the collective wealth then be spent? “Cutting taxes” is the battle cry of every politician, a knee-jerk reaction to convention and a dishonest bow to some imagined base. The truth is every government will tax and every government will spend, and they must. We all want the water to run when we turn the faucet on; we all want the bridge to stand as we cross it; we all want the sewers to do their job. In a democracy, we should not only openly discuss the truth of taxing and spending, but we should insist on transparency on the big question of who is being taxed and where those taxes get spent. Let the people decide whether to fund war or education, incarceration or social security, militarization or health care. Straight up. Studs Terkel, rabble-rouser, activist, chronicler of the uncommonly common, artist-in-residence, peacenik, gad-fly, listener, died at 96 at his home here on Halloween. Studs was a singular Chicago character in this wildly diverse world, someone who lived fully through his own American century– remember, he was red-baited before he was celebrated. Studs embodied the democratic spirit: wide-awake, generous, critical and hopeful, skeptical and engaged. Lover of life, gentle champion of the outcast, friend to thousands and ally to all, we were blessed to have him. We need to try to love one another as hard as we can for as long as we can, for it’s all we’ve got. So long, Studs. 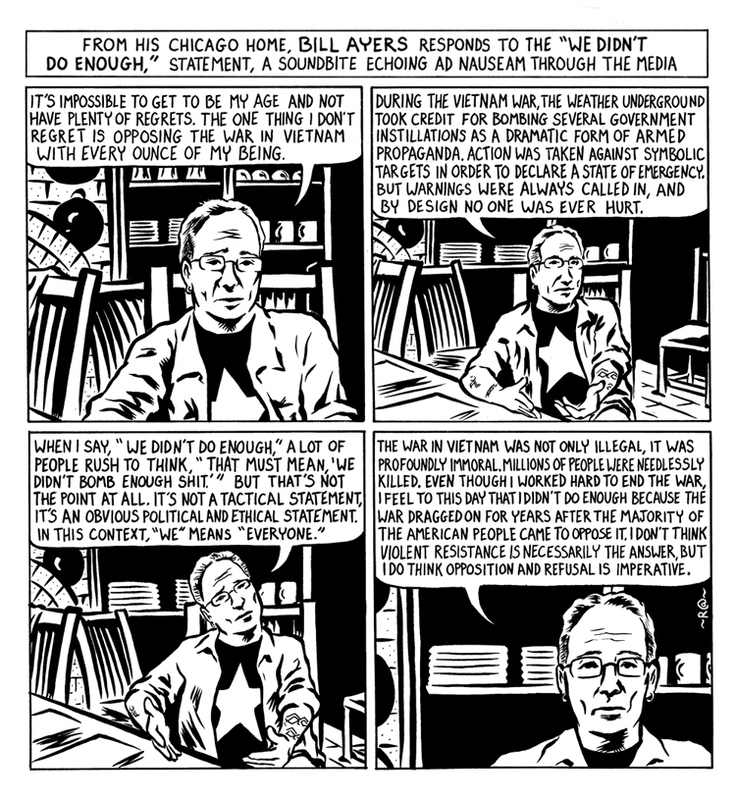 You are currently browsing the Bill Ayers blog archives for November, 2008.